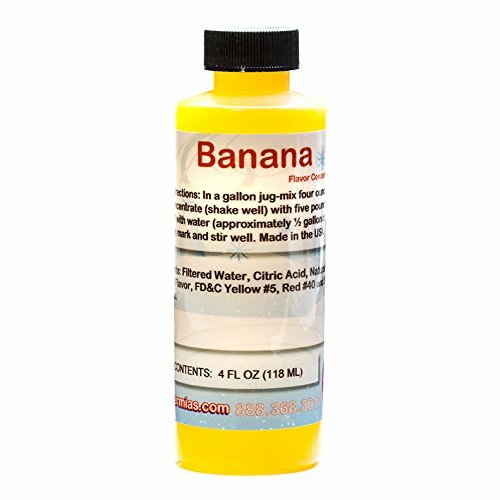 Delicious banana shaved ice or sno cone flavor concentrate. Made in the USA. Very easy to mix: To make a gallon of syrup add 5 pounds of sugar, 4 ounce of flavor concentrate, add water to to the gallon mark stir well, serve. To extend the life of the syrups you can add optional preservatives (citric acid, sodium benozate). Each 4 ounces of concentrate will make 1 gallon of syrup when mixed. This is professional, true to taste shaved ice flavor. Life of concentrate 1-2 years. 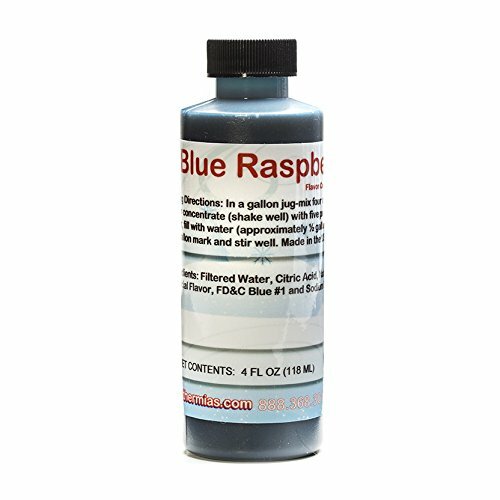 Delicious blue raspberry shaved ice or sno cone flavor concentrate. Made in the USA. Very easy to mix: To make a gallon of syrup add 5 pounds of sugar, 4 ounce of flavor concentrate, add water to to the gallon mark stir well, serve. To extend the life of the syrups you can add optional preservatives (citric acid, sodium benozate). Each 4 ounces of concentrate will make 1 gallon of syrup when mixed. This is professional, true to taste shaved ice flavor. Life of concentrate 1-2 years. 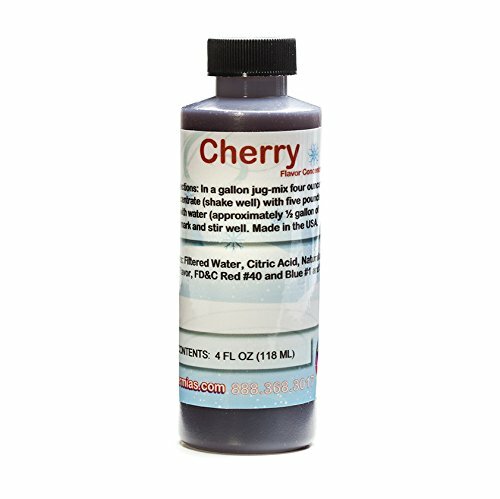 Delicious cherry shaved ice or sno cone flavor concentrate. Made in the USA. Very easy to mix: To make a gallon of syrup add 5 pounds of sugar, 4 ounce of flavor concentrate, add water to to the gallon mark stir well, serve. To extend the life of the syrups you can add optional preservatives (citric acid, sodium benozate). Each 4 ounces of concentrate will make 1 gallon of syrup when mixed. This is professional, true to taste shaved ice flavor. Life of concentrate 1-2 years. 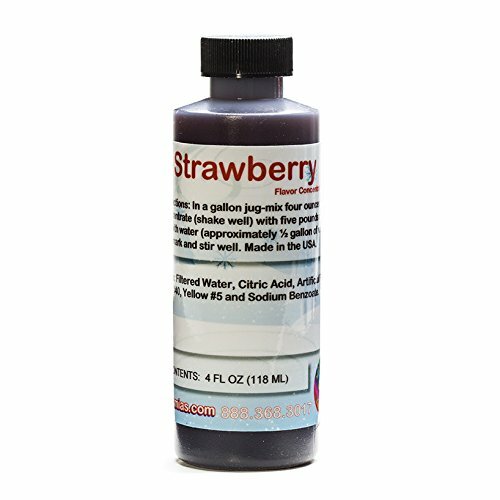 Delicious strawberry shaved ice or sno cone flavor concentrate. Made in the USA. Very easy to mix: To make a gallon of syrup add 5 pounds of sugar, 4 ounce of flavor concentrate, add water to to the gallon mark stir well, serve. To extend the life of the syrups you can add optional preservatives (citric acid, sodium benozate). Each 4 ounces of concentrate will make 1 gallon of syrup when mixed. This is professional, true to taste shaved ice flavor. Life of concentrate 1-2 years. 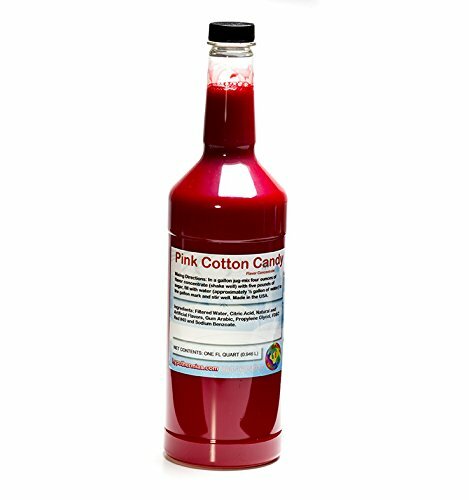 Delicious pink cotton candy shaved ice or sno cone flavor concentrate. Made in the USA. Very easy to mix: To make a gallon of syrup add 5 pounds of sugar, 4 ounce of flavor concentrate, add water to to the gallon mark stir well, serve. To extend the life of the syrups you can add optional preservatives (citric acid, sodium benozate). Each 4 ounces of concentrate will make 1 gallon of syrup when mixed. This is professional, true to taste shaved ice flavor. Life of concentrate 1-2 years. 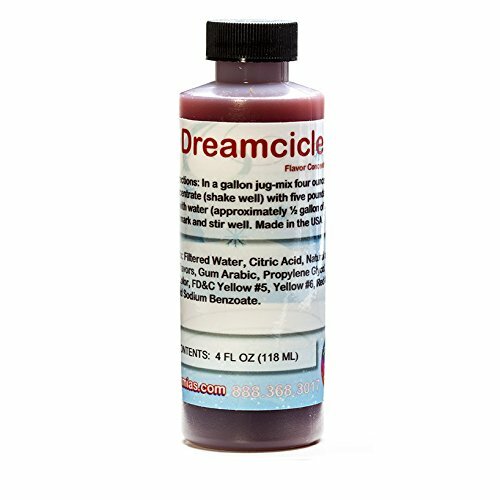 Delicious dreamcicle shaved ice or sno cone flavor concentrate. Made in the USA. Very easy to mix: To make a gallon of syrup add 5 pounds of sugar, 4 ounce of flavor concentrate, add water to to the gallon mark stir well, serve. 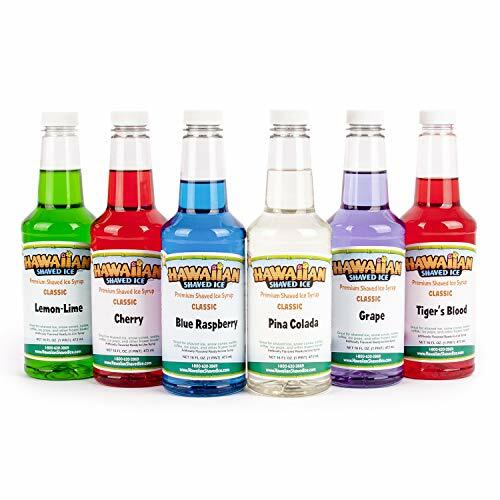 To extend the life of the syrups you can add optional preservatives (citric acid, sodium benozate). Each 4 ounces of concentrate will make 1 gallon of syrup when mixed. This is professional, true to taste shaved ice flavor. Life of concentrate 1-2 years. 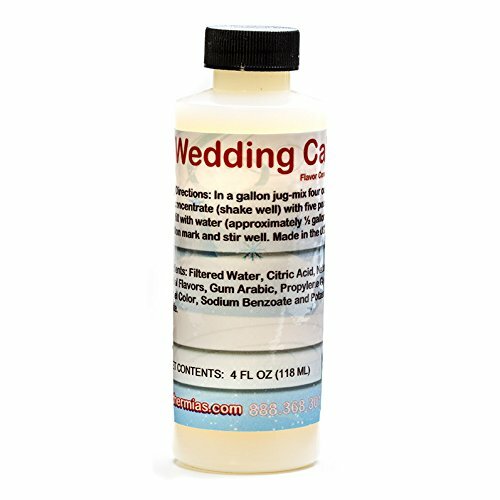 Delicious wedding cake shaved ice or sno cone flavor concentrate. Made in the USA. Very easy to mix: To make a gallon of syrup add 5 pounds of sugar, 4 ounce of flavor concentrate, add water to to the gallon mark stir well, serve. To extend the life of the syrups you can add optional preservatives (citric acid, sodium benozate). Each 4 ounces of concentrate will make 1 gallon of syrup when mixed. This is professional, true to taste shaved ice flavor. Life of concentrate 1-2 years. 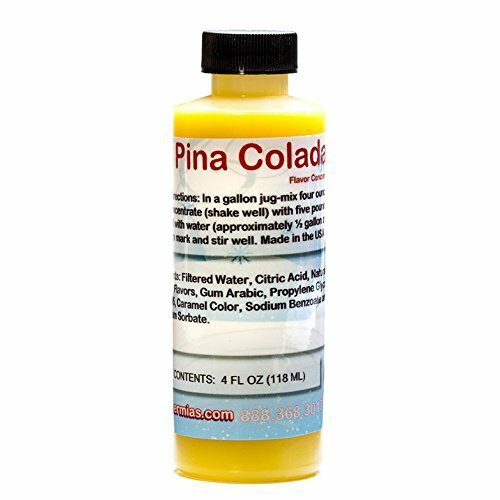 Delicious pina colada shaved ice or sno cone flavor concentrate. Made in the USA. Very easy to mix: To make a gallon of syrup add 5 pounds of sugar, 4 ounce of flavor concentrate, add water to to the gallon mark stir well, serve. To extend the life of the syrups you can add optional preservatives (citric acid, sodium benozate). Each 4 ounces of concentrate will make 1 gallon of syrup when mixed. This is professional, true to taste shaved ice flavor. Life of concentrate 1-2 years. 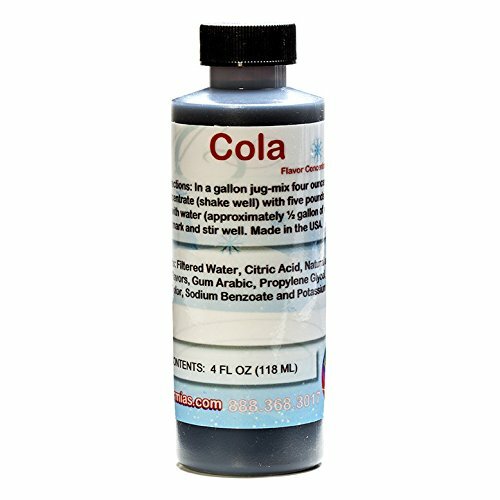 Delicious cola shaved ice or sno cone flavor concentrate. Made in the USA. Very easy to mix: To make a gallon of syrup add 5 pounds of sugar, 4 ounce of flavor concentrate, add water to to the gallon mark stir well, serve. To extend the life of the syrups you can add optional preservatives (citric acid, sodium benozate). Each 4 ounces of concentrate will make 1 gallon of syrup when mixed. This is professional, true to taste shaved ice flavor. Life of concentrate 1-2 years. 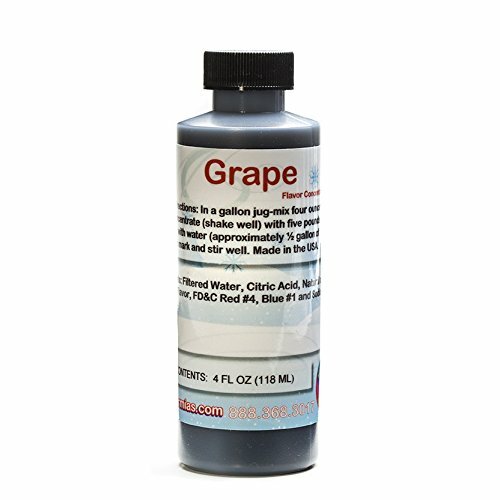 Delicious grape shaved ice or sno cone flavor concentrate. Made in the USA. 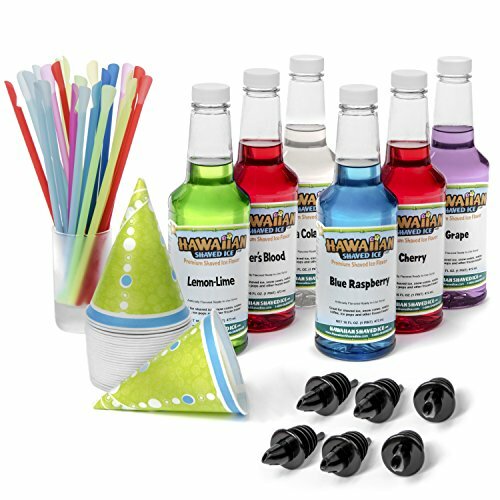 Very easy to mix: To make a gallon of syrup add 5 pounds of sugar, 4 ounce of flavor concentrate, add water to to the gallon mark stir well, serve. To extend the life of the syrups you can add optional preservatives (citric acid, sodium benozate). Each 4 ounces of concentrate will make 1 gallon of syrup when mixed. This is professional, true to taste shaved ice flavor. Life of concentrate 1-2 years. 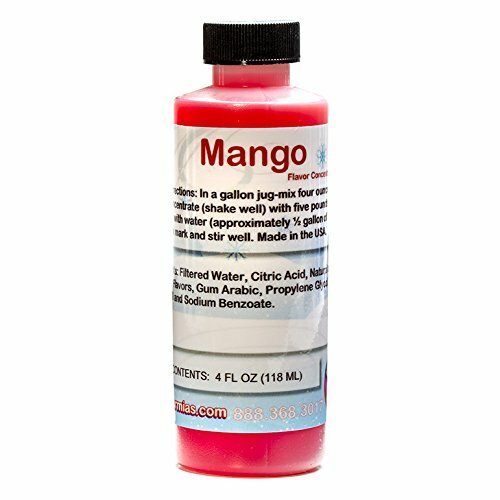 Delicious mango shaved ice or sno cone flavor concentrate. Made in the USA. Very easy to mix: To make a gallon of syrup add 5 pounds of sugar, 4 ounce of flavor concentrate, add water to to the gallon mark stir well, serve. 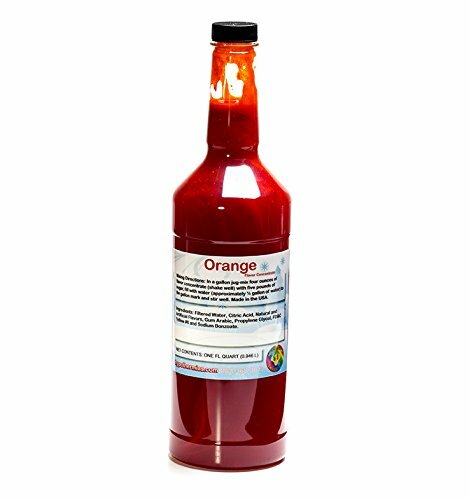 To extend the life of the syrups you can add optional preservatives (citric acid, sodium benozate). Each 4 ounces of concentrate will make 1 gallon of syrup when mixed. This is professional, true to taste shaved ice flavor. Life of concentrate 1-2 years. Delicious green apple shaved ice or sno cone flavor concentrate. Made in the USA. Very easy to mix: To make a gallon of syrup add 5 pounds of sugar, 4 ounce of flavor concentrate, add water to to the gallon mark stir well, serve. To extend the life of the syrups you can add optional preservatives (citric acid, sodium benozate). Each 4 ounces of concentrate will make 1 gallon of syrup when mixed. This is professional, true to taste shaved ice flavor. Life of concentrate 1-2 years. 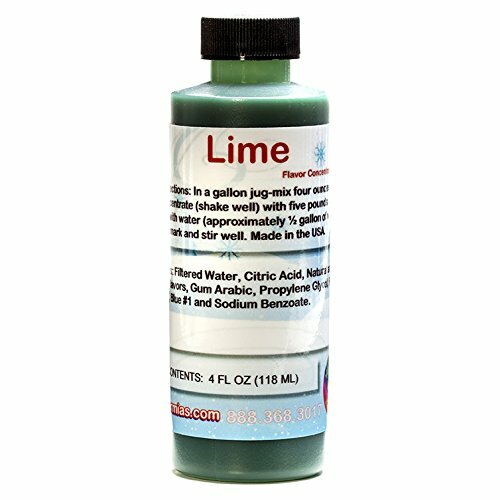 Delicious lime shaved ice or sno cone flavor concentrate. Made in the USA. Very easy to mix: To make a gallon of syrup add 5 pounds of sugar, 4 ounce of flavor concentrate, add water to to the gallon mark stir well, serve. To extend the life of the syrups you can add optional preservatives (citric acid, sodium benozate). Each 4 ounces of concentrate will make 1 gallon of syrup when mixed. This is professional, true to taste shaved ice flavor. Life of concentrate 1-2 years. 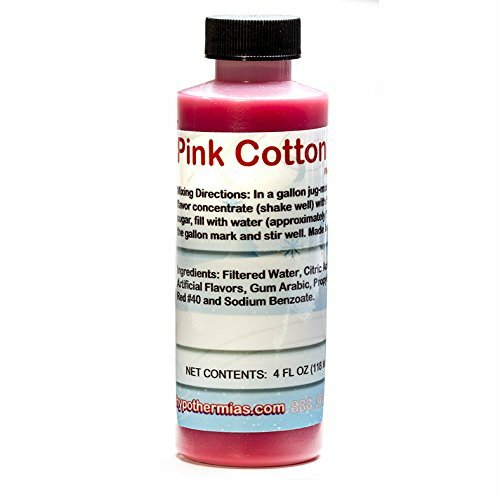 Delicious pink cotton candy shaved ice or sno cone flavor concentrate. Made in the USA. Very easy to mix: To make a gallon of syrup add 5 pounds of sugar, 4 ounce of flavor concentrate, add water to to the gallon mark stir well, serve. To extend the life of the syrups you can add optional preservatives (citric acid, sodium benozate). Each quart of concentrate will make 8 gallons of syrup when mixed. This is professional, true to taste shaved ice flavor. Life of concentrate 1-2 years. 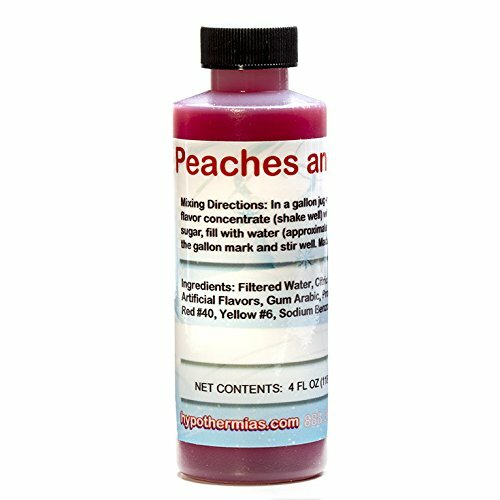 Delicious peaches and cream shaved ice or sno cone flavor concentrate. Made in the USA. Very easy to mix: To make a gallon of syrup add 5 pounds of sugar, 4 ounce of flavor concentrate, add water to to the gallon mark stir well, serve. To extend the life of the syrups you can add optional preservatives (citric acid, sodium benozate). Each 4 ounces of concentrate will make 1 gallon of syrup when mixed. This is professional, true to taste shaved ice flavor. Life of concentrate 1-2 years. 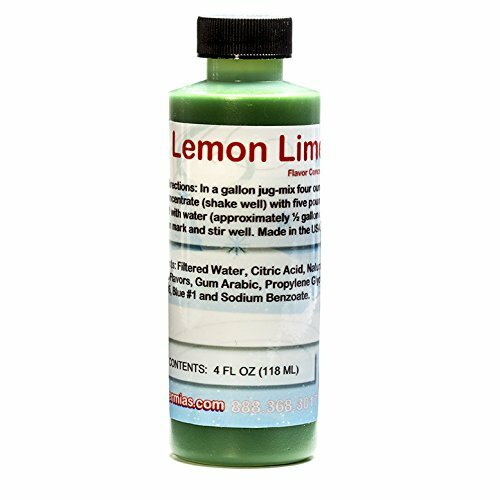 Delicious lemon lime shaved ice or sno cone flavor concentrate. Made in the USA. Very easy to mix: To make a gallon of syrup add 5 pounds of sugar, 4 ounce of flavor concentrate, add water to to the gallon mark stir well, serve. To extend the life of the syrups you can add optional preservatives (citric acid, sodium benozate). Each 4 ounces of concentrate will make 1 gallon of syrup when mixed. This is professional, true to taste shaved ice flavor. Life of concentrate 1-2 years.